$850.00 Activist of the OSOAVIAKhIM badge, #3573, circa early 1930s. Hallmarked silver version in very fine condition, with nicely preserved enamel. Beautiful piece! $380.00 Activist of the OSOAVIAKhIM badge, #27763, mid to late 1930s. In very fine condition. 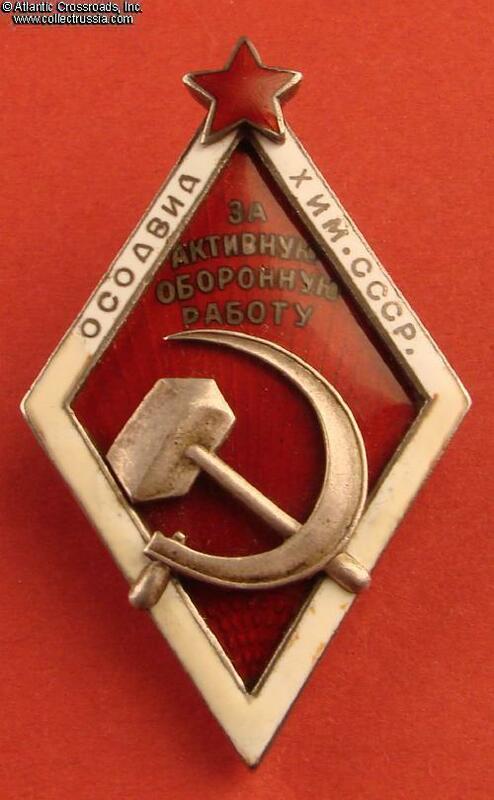 $250.00 OSOAVIAKhIM membership badge, Type 2, 1941. The larger and by far the scarcer of the two versions of the membership badge. Produced for only less than half a year until the German invasion. In excellent condition, very uncommon for this badge. $90.00 Ready for PVKhO badge, 1st level, Type 1, larger variation, 1935-1939. In excellent condition and includes original, serial numbered and maker marked screw plate. $225.00 Voroshilov Marksman Badge, OSOAVIAKhIM issue, large type, #132383, 1932-1934. Early, single level badge issued before the introduction of the two levels of marksmanship in 1934. In excellent condition - very uncommon for the early badge. $295.00 Voroshilov Horseman badge, variation with thin screw post, 1936-1941. In very fine to excellent condition, despite the re-threaded screw post. A very impressive and attractive early WW2 / pre-Patriotic War badge! $295.00 To a Fighter of OKDVA, OSOAVIAKhIM issue, 1930. Essentially a campaign medal, awarded to servicemen of the Marshal Blyukher's Far Eastern army for successful campaign against Manchurian warlord in 1929. In very fine condition, better than the average for this badge. $195.00 Parachute jump badge, 1931 type, #27401, OSOAVIAKhIM issue, circa late 1930s. In very fine to excellent condition, well above the average for this first Soviet Paratrooper's badge. Includes original maker marked screw plate. $120.00 Parachute Jump badge, 1936 type, circa late 1940s through 1950s. In outstanding condition.